My today’s post is also a snack like the last one but not exactly a street food. 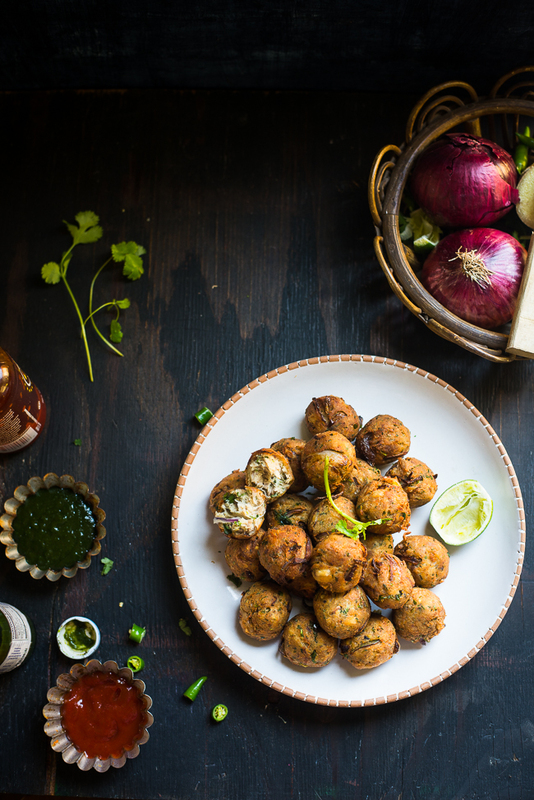 It’s the classic Indian finger food called Pakora. In some parts of India, this fried snack is also known as Bajii. 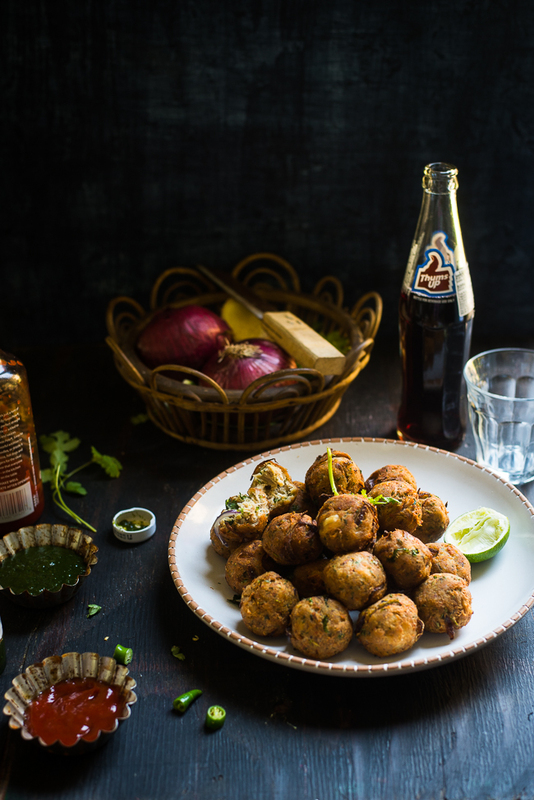 Pakora has many variations in both vegetarian and non-vegetarian categories. 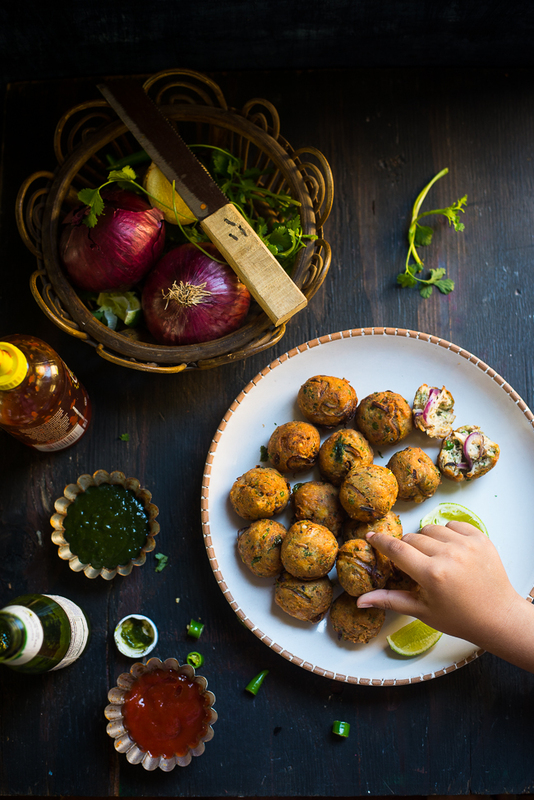 Depending on the type, sliced vegetables or meat/fish is wrapped in gram flour batter or rolled into small balls. Then they are deep-fried in hot oil till the time outside surface becomes crisp. Among all the versions, chicken Pakora is very common and popular among all the non-vegetarians. 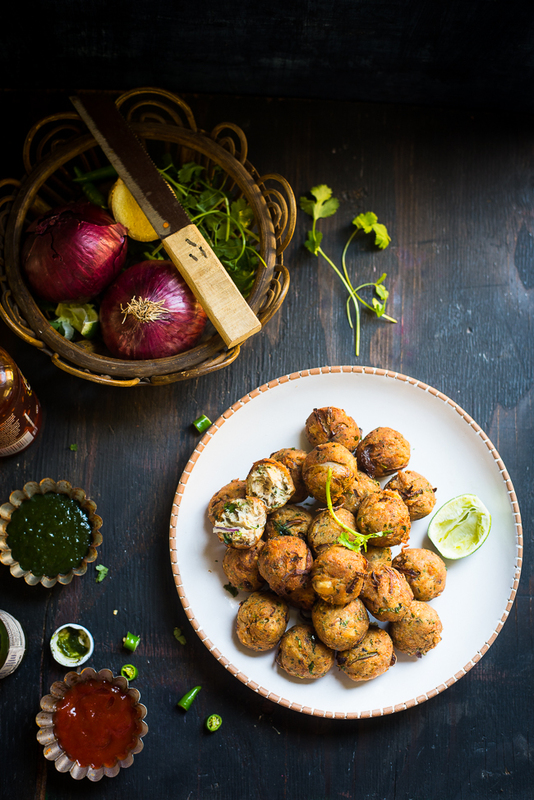 Pakoras can be served as a snack or as a party appetizer. Generally people love to have this snack with a cup of tea on a regular evening after returning from office or during a lazy afternoon on a rainy day. 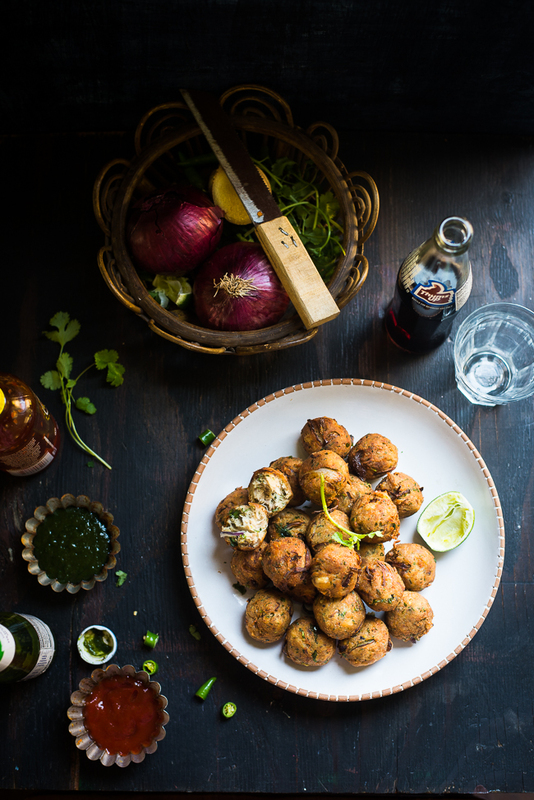 Today I will share a recipe of chicken Pakora, bit different from the traditional one. Normally small pieces of chicken are dipped in a batter and deep-fried in hot oil. 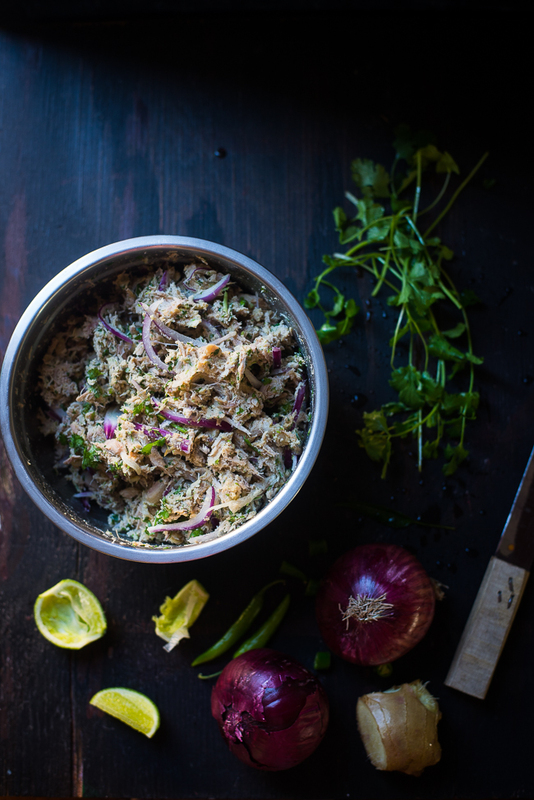 The process I followed is little different, where shredded cooked chicken is mixed with chopped onions, ginger, chilies, cilantro and then rolled into small balls before it’s fried. I found this new process somewhere in facebook and seemed very interesting to me. I have tried this new recipe couple of times but was never happy with the pictures I captured. The opportunity came again when my friends planned for a potluck party to watch Copa America final together. Hope you would like both the recipe and pictures this time. Though it was not great match for my husband and few others who were Messi fan, but all the delicious food could compensate their loss to some extent. 1. Add salt, red chili powder and ginger - garlic paste to boneless chicken pieces and rub it gently. 3. Transfer chicken pieces to a bowl, allow to cool and shred the chicken meat. 4. Now add the sliced onion, chopped ginger, chilies, cilantro and salt. Mix it well. Add gram four and rice powder. Again mix it nicely and make a dough. Serve hot with a dipping sauce.